Yum, Yum, Yum. I love this holiday! Who doesn't love eating all these rich and delicious foods and visiting with the ones you love. On the other hand Holidays can be overwhelming because well it is A LOT OF WORK! I mean the shopping and the built up expectations. The thing that I like to make a conscious effort to do now is to just move all that stress out of my brain and just look really into the hearts of everyone we get to spend the holiday with. You know really look into the eyes of my kids and Weston and realize how thankful I am for them. There is a true comfort to find the joy in ones life no matter the circumstances. I know that it isn't always easy! Trust me, I know! That is why it takes a conscious effort to be Thankful and we have a special day dedicated to just that. Thank you HISTORY. But so far I think that it will be easy for me this year. I have witnessed such grace and kindness in others through out the year and I am working on myself as much as I can. So much in fact that I have tried to start my new years resolutions early because I DESPERATELY needed them. 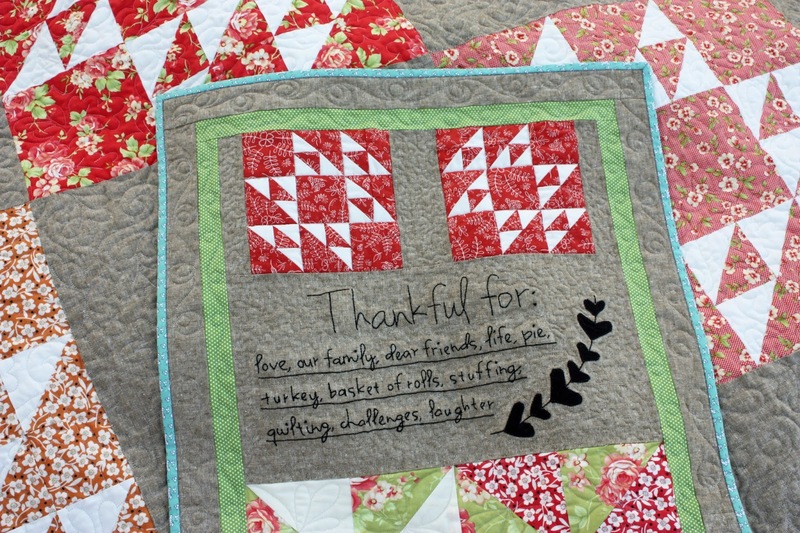 As always though I am thankful for Quilting!! I love that it is my career now and I love being creative. I can't explain how it heals my heart. I just find so much comfort in the whole thing. I don't exactly love all the business aspects of it but I am learning to just keep truckin'. Things evolve over time and I can see improvement in myself. I really love the design of this newest pattern. It has a lot of my heart in it and I just love how all the elements came together this time. 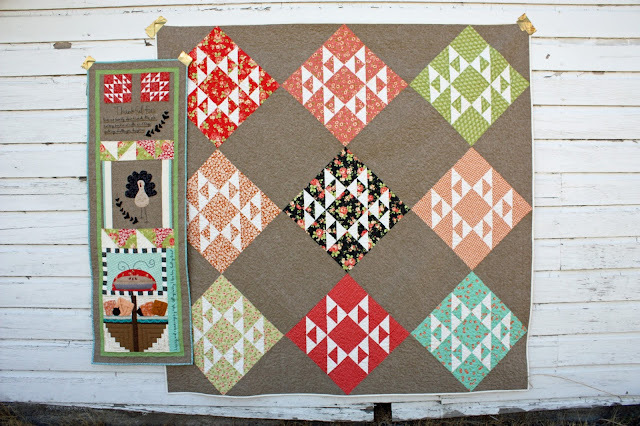 One of the most exciting things for me is to work on a project that is going to be displayed right away. It just feels so much more natural because you can feel the colors out just right. There is that instant gratification that you will have something new for the holidays to decorate with. It is the best. I have to make a little confession though... our house isn't in the best of shape right now. We have patches and primer all over the walls and holes in the floor and lights missing and doors missing. We have been working on our house since we have moved in and hit a couple roadblocks along the way. So here we go entering my favorite season and time of year where I LOVE to decorate and I don't really get to enjoy that. Oh well :( I am still thankful either way. There is always next year. I am in love this pattern. LOVE. Love. love. 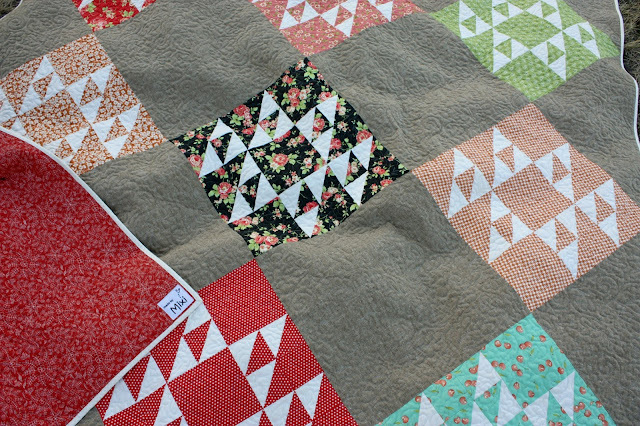 I also love the lap quilt. It is GORGEOUS!! 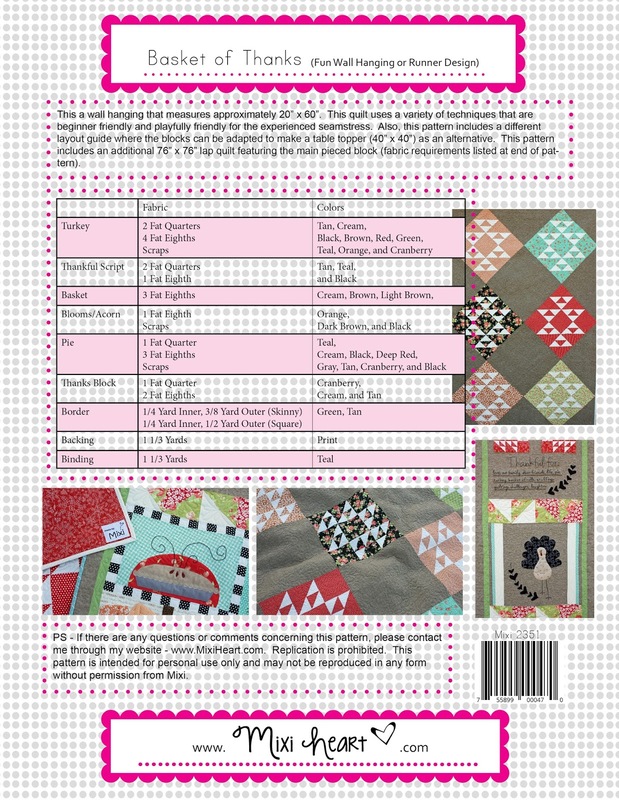 I designed the skinny with all the elements of the holiday. 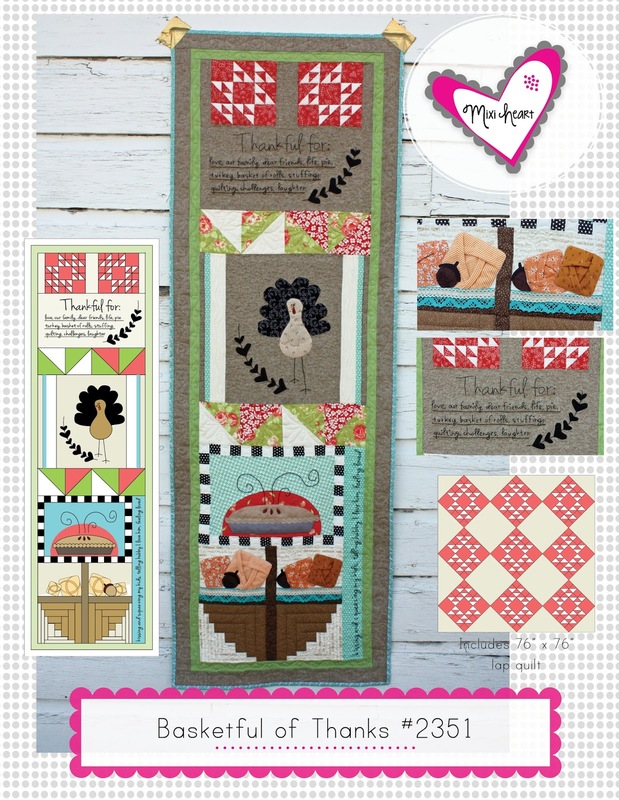 The thankful script reminds me of a recipe card which we all pull out when we make our favorite dishes. I also used the lower script to personalize the quilt to myself by adding the three things that I am most thankful for and the things that define my life. What really pushed me into finishing this design was the fabrics. 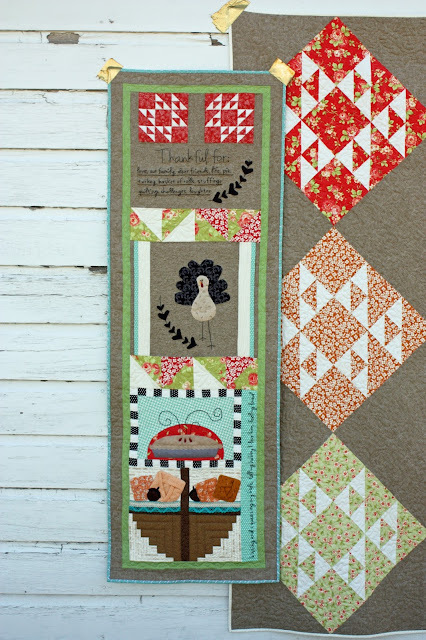 Fig Tree designed Farmhouse for Moda and I just died over the fabrics. They were AMAZING! I loved the color palette. I have a whole stack of fat quarters and scraps left so the bundle is just going to keep giving. I know that I will treasure all the things that will come in the future from the fabrics. What am I thankful for? 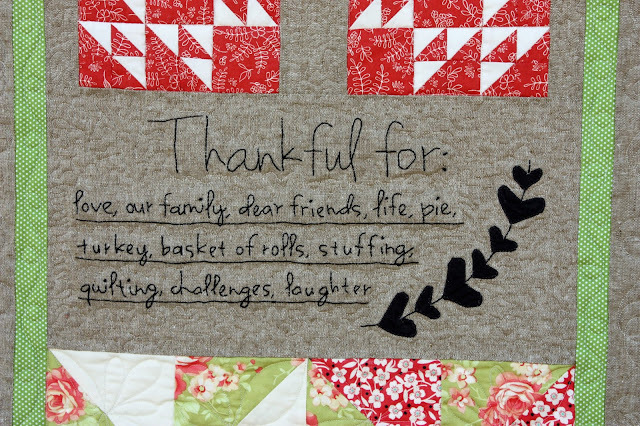 Well love, our family, dear friends, life, pie, turkey, baskets of rolls, stuffing, quilting, challenges, laughter. I am looking forward to asking all the little ones at the table this year what they are thankful for. 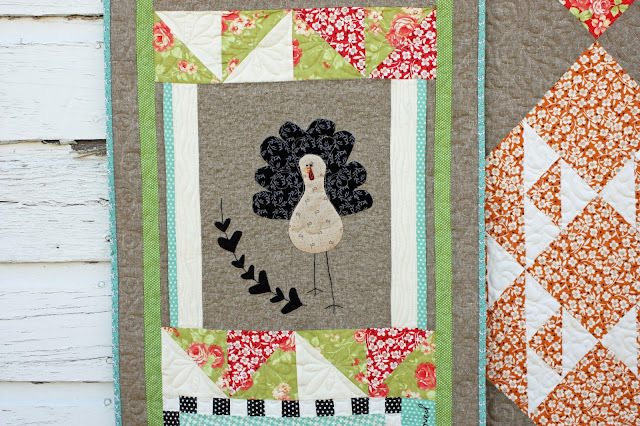 I love the little gobbling Turkey. I think I might add some buttons for the eyes rather than just the french knots. It might need that little touch. 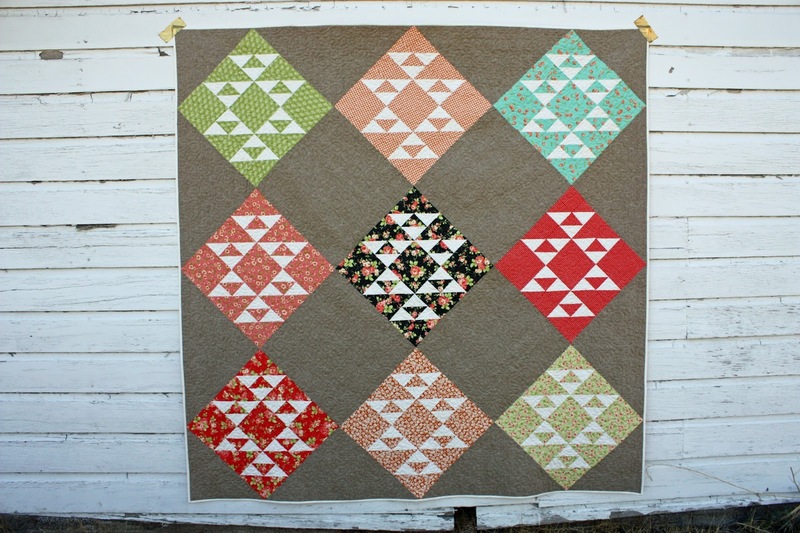 The background that I used for this quilt is Taupe Linen Essex. I felt that it just gave the perfect amount of warmth to the quilt. Very appropriate. 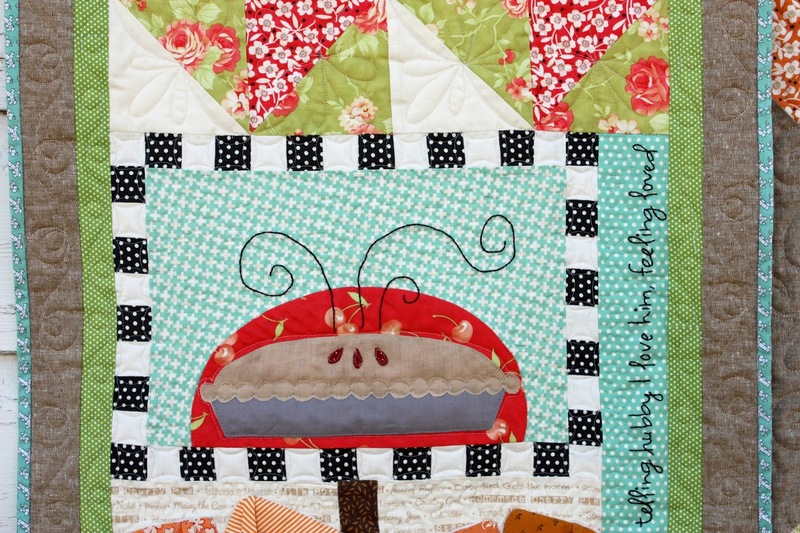 I thought about making a pumpkin pie but Fig Tree made the cutest cherry print with this line and I figured that people eat all kinds of pies on Thanksgiving. I personally love a pumpkin cheesecake. So anyway. 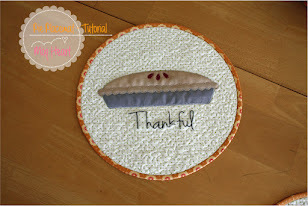 This is the same little pie from my pie placemat tutorial. It sure fits in perfectly into this pattern. You can't have a Thanksgiving dinner without HOMEMADE ROLLS in my family now. I was taught by my mom to make the most delicious rolls. Even though the past years I haven't been close with my mom I do appreciate the great times we have had together. I have reflected on that the last bit. I just wish sometimes that I could be a time-travelor and be able to stop life events from happening. But you know what I bet I am not the only person that thinks that. I actually KNOW that I am not the only person that thinks that. It takes a strong human spirit to find the good out of bad situations. I am not completely strong yet but I find that with each year and each lesson that I am getting that way. I think that it is meant to be a soft strength and that is the tricky part. Well these rolls are just adorable. They are three-dimensional. It was a blast to make them. It took a couple trys to get them just so. My little Alex wanted me to make him a collection of rolls he could just keep. I didn't. Geez Louise. He can just enjoy them in the quilt here. I know that embroidery takes a little bit of time but I have to say that when I was stitching these words I was kind of having this amazing special time. I think it was because they have SO much meaning to me! I just thought "this" is what makes "this" time special for me and it meant a lot. I could feel it deep inside. I quilted the lap quilt with the cutest design!! Cute little leaves just nestled into each other. For the backing I used Wild & Free Crimson Flower for Art Gallery. WOW! Stunning to say the least. For the first time ever I am offering lap quilt pattern solo. 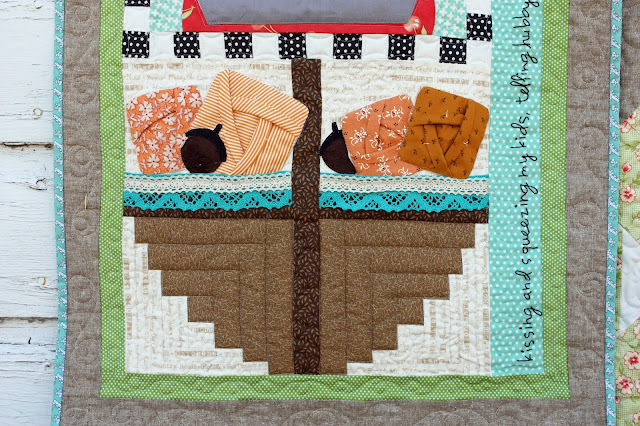 I am going to work up the other lap quilts of the Skinny Series too... but I've got to find some time in our busy thing we call life! I am extremely proud to offer this one as the first one. It is Thanks Star. It is the first in the Star Series. 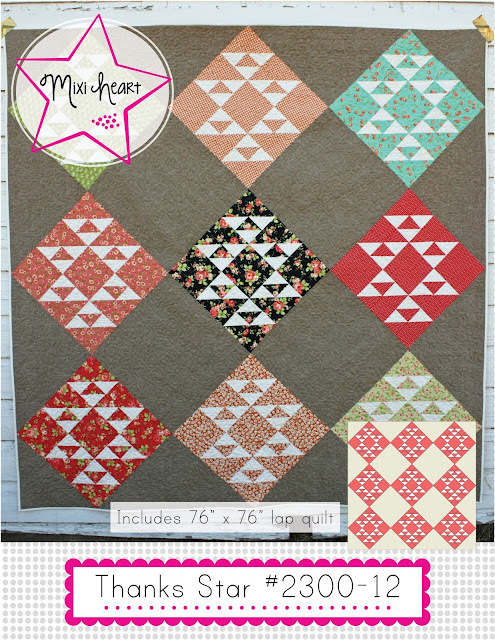 These are basically the STARS of the quilt samplers. 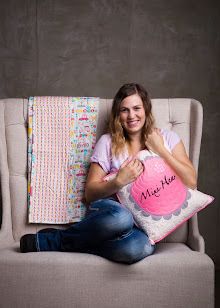 They are fun lap quilts that showcase fabric and are the perfect size to cuddle up two peeps. See how the two blocks in the quilt samplers are just babies. They were so tiny. But they are just darling. So thank you so much to Fig Tree for making such a cute collection and adding black just for me! I love it!! I wish everyone a wonderful Holiday with their loved ones. Thank you. Thank you. Thank you. So amid all the craziness I am going to offer a sale in my Etsy shop all of Thanksgiving weekend and into the following week to share my Thanks. I will update here with a code if I remember, ahh (I remembered!!! Yay!!! 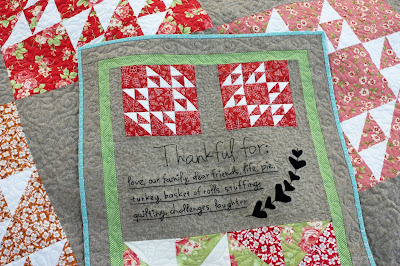 Enter Gratitude in my Etsy for 20% off everything... patterns, fabrics, oh my, till December 3rd)!! But if I don't just check out my Shop Header in Etsy or my Instagram @MixiHeart or heck just message me from Etsy or e-mail and I will get them no matter what to whoever wants one. I love it! So adorable. I love the rolls too-I am laughing that Alex wanted his own :) I hope you guys have a great Thanksgiving!